With efficiencies up to 92%, Modern Heating and Plumbing has the gas fireplace or insert for you! Whether you’re looking for a “see through,” a corner, a free-standing or a fireplace that will heat a small or large room, we have what you need. Kozy Heat, Regency and Central fireplaces have what seem to be limitless options: doors, finishes, thermostatic remotes, blowers, venting, screens, adjustable flames … We even have models which will operate without electricity! Stop by our showroom and we’ll help you choose a fireplace or insert with quality workmanship that will give you enjoyment (and efficient heating) for years to come. Click on the fireplace links for more information about these fine fireplace lines! Patio Fire Pit Tables…a fire pit and table all in one! It’s time to get fired up! The leaves are falling, the kids are back in school and for many the best time of year is here! During the day it’s warm but the evenings cool off quickly. It’s perfect weather to use a gas outdoor fire pit and it’s also a perfect time to buy one. The holidays are fast approaching and why not light up the night and give the gift of warmth! These warm, glowing fires will become the place to gather with family friends for years to come! Don’t forget, these fire pits are a fire pit and a table all in one. And there is a wide variety of styles from which to choose. Want to build a custom fire pit? We also sell “do it yourself” burner kits. Enjoy the glow! Purchase your fire pit table by December 10, 2014, and receive a free cover and an additional 10% off. For forty years, Kozy Heat has had a commitment to quality and customer satisfaction. 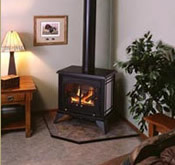 They offer a complete line of gas and wood-burning replaces and stylish accessories to complement any décor. Adding a replace to your home is one of the best ways to increase the value of your home. Dedicated to function, reliability and safety, Kozy Heat is the logical choice when purchasing a replace. Kozy Heat started in 1976 in Southern Minnesota. The rst Kozy Heat was a wood-burning replace created during the fuel embargo. The word spread about this wonderful wood-burning alternative for heating and within two years Kozy Heat was selling replaces throughout Minnesota. Modern gas replaces are becoming more and more popular and the re is as impressive as a wood-burning re. Gas replaces are not only a great heat source, but a decorative centerpiece for your home. When shopping for a replace, choose from traditional wood-burning replaces, inserts which convert masonry wood- burning replaces to gas, propane or natural gas burning replaces and free-standing replaces. Many options to suit many needs. Stop by our showroom and we will help you choose the replace that’s best for you! We are located at 18550 Hwy 59 North in Detroit Lakes.